Ever wished you could sing in a group like Pentatonix or the Barden Bellas from Pitch Perfect? Learn directly from Deke Sharon – the “father of contemporary a cappella". Producer of The Sing-Off, arranger, musical director, and vocal producer of Pitch Perfect 1, 2 & 3, and the new BBC One Pitch Battle, Deke has worked with everyone in a cappella from Pentatonix to Anna Kendrick. Learn the basics in Deke’s Introduction to A Cappella class, right through to watching sophisticated techniques applied to a live group, in the masterclasses. For more information, go to the website. 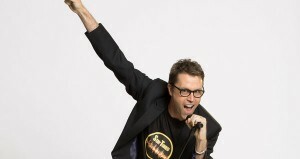 The A Cappella Festival with Deke Sharon is over two days, 9.30am - 3.30pm. As well, on Wednesday there will be a Festival Concert from 4.45pm - 6.00pm. Wednesday late afternoon concert (4.45pm-6.00pm) tickets - $5 school students, $10 for adults, $25 for a family pass (2 adults and 2 children). Deke Sharon's visit to Australia is sponsored by Barbershop Harmony Australia.